US to send military aid to Venezuela as France demands vote – Royal Times of Nigeria. The US says it is sending aid to crisis-hit Venezuela following a request from Juan Guaidó, the opposition leader who has declared himself interim president. Mr Guaidó’s move last month won swift backing from the US and others but triggered a power struggle. 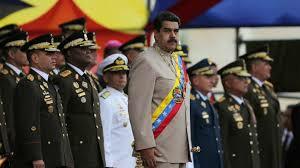 Venezuela’s President Nicolás Maduro has accused him of mounting a coup and retains major international allies. He has dismissed US offers of aid as a pretext for military intervention. Trump says sending the military to Venezuela is “an option”. Meanwhile France says it will recognise Guaido as interim president if Maduro does not announce a presidential vote by tonight. Maduro proposed an early parliamentary election on Saturday, seeking to shore up his crumbling rule after a senior general defected to the opposition and tens of thousands thronged the streets in protest at his government. France’s European Affairs Minister, Nathalie Loiseau, dismissed that proposal as a “farce”. Maduro was sworn in for a second term following disputed elections which many opposition leaders did not contest because they were in jail or boycotting them. 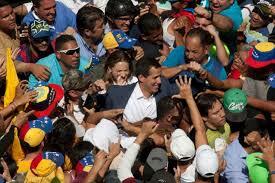 Later that month, Mr Guaidó, who is head of Venezuela’s National Assembly, declared himself president. On Saturday he said protests would continue until his supporters had achieved “freedom”.